Introduction The incidence of melanoma is increasing faster than any other major cancer both in Brazil and worldwide. The Southeast of Brazil has especially high incidences of melanoma, and early detection is low. Exposure to UV radiation represents a primary risk factor for developing melanoma. Increasing attractiveness is a major motivation for adolescents for tanning. A medical student-delivered intervention that harnesses the broad availability of mobile phones as well as adolescents’ interest in their appearance may represent a novel method to improve skin cancer prevention. Methods and analysis We developed a free mobile app (Sunface), which will be implemented in at least 30 secondary school classes, each with 21 students (at least 30 classes with 21 students for control) in February 2018 in Southeast Brazil via a novel method called mirroring. In a 45 min classroom seminar, the students’ altered three-dimensional selfies on tablets are ‘mirrored’ via a projector in front of their entire class, showing the effects of unprotected UV exposure on their future faces. External block randomisation via computer is performed on the class level with a 1:1 allocation. Sociodemographic data, as well as skin type, ancestry, UV protection behaviour and its predictors are measured via a paper–pencil questionnaire before as well as at 3 and 6 months postintervention. The primary end point is the group difference in the 30-day prevalence of daily sunscreen use at a 6-month follow-up. Secondary end points include (1) the difference in daily sunscreen use at a 3-month follow-up, (2) if a self-skin examination in accordance with the ABCDE rule was performed within the 6-month follow-up and (3) the number of tanning sessions. Ethics and dissemination Ethical approval was obtained from the ethics committee of the University of Itauna. Results will be disseminated at conferences and in peer-reviewed journals. Trial registration number NCT03178240; Pre-results. This is the first study measuring the longitudinal effectiveness of a photoageing mobile app to change sun protection behaviour. External randomisation via computer and a relatively high number of clusters ensure good comparability between groups. Cluster effects cannot be excluded because the intervention and control classes are located in the same schools. Despite the effectiveness of daily sunscreen and its implementation in international dermatological guidelines,34 a study conducted in Brazil among 398 medical students from the city of Curitiba showed that only 8.4% use sunscreen daily, 4.3% had already used tanning beds and 85.5% had past sunburns despite having undergone a clinical rotation in a Dermatology department.8 The lack of exemplary behaviour among prospective physicians regarding skin cancer prevention is known on a global scale.35–37 The authors of this study have concluded that novel engagement methods are needed to answer the increasing demand for skin cancer awareness among physicians. Unhealthy behaviour with respect to UV exposure is mostly initiated in early adolescence,41 commonly with the belief that a tan increases attractiveness42–44 and the problems related to melanoma as well as skin atrophy are too far in the future to fathom. In the setting of skin cancer prevention, a quasi-experimental study by Williams et al 57 demonstrated significantly higher scores for predictors of sun protection behaviour in young women from the UK (70 participants in total) using a photoageing desktop programme. Furthermore, the photoageing software ‘showed promising reduction in young adults’ tanning intentions in a study with 10 participants in total (7 women and 3 men).58 However, prior studies are limited by their small sample size and limitations related to expanding the target population. 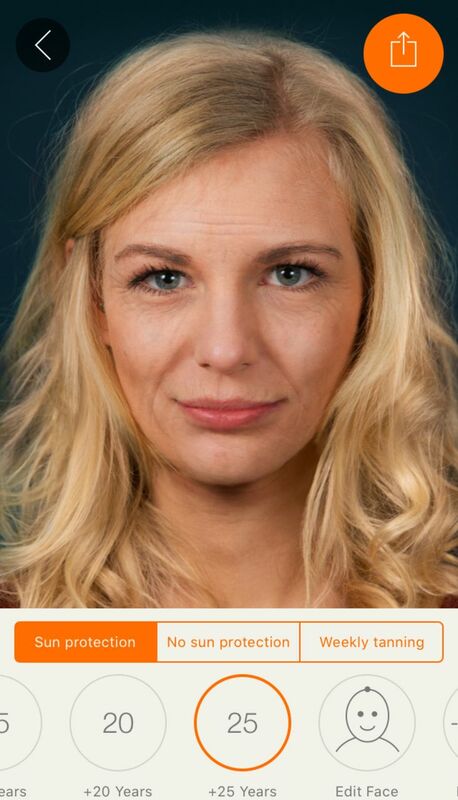 We harnessed the widespread availability of mobile phones and adolescents' interest in appearance to develop the free mobile phone app ‘Sunface,’ which enables the user take a selfie and then offers three categories: ‘daily sun protection’, ‘no sun protection’ and ‘weekly tanning,’ showing the altered face at 5–25 years in the future (figures 1–4). 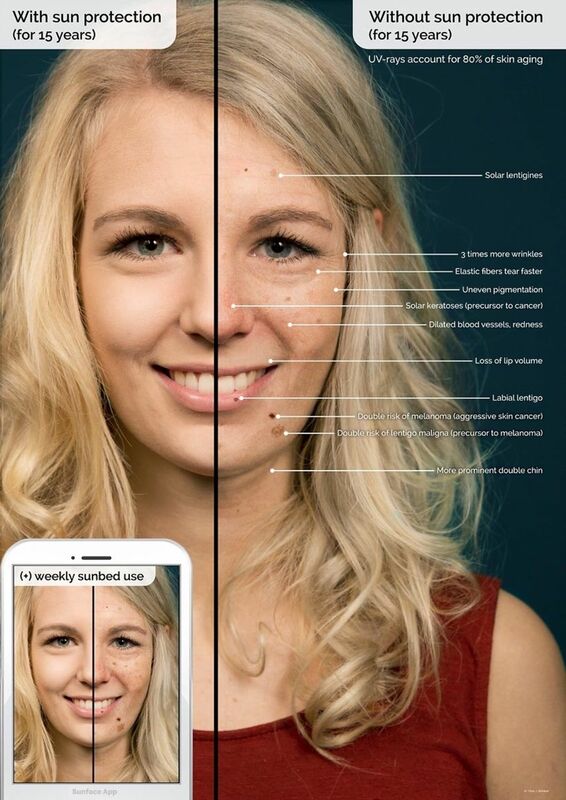 All effects are based on the individual skin type that the user can choose at the start of the app (figure 5). The app also shows the most common UV-induced skin cancers via extra buttons and calculates how the OR is increased with different behaviours. In addition, the app gives advice on sun protection, explains the facial changes and encourages skin examinations using the ABCDE rule (Asymmetry, Border irregularity, Color variety, Diameter and Evolution59). Effect view: 25 years of skin ageing with sun protection. Effect view: 5 years of skin ageing with sun protection. Effect view: 5 years of weekly tanning without sun protection. 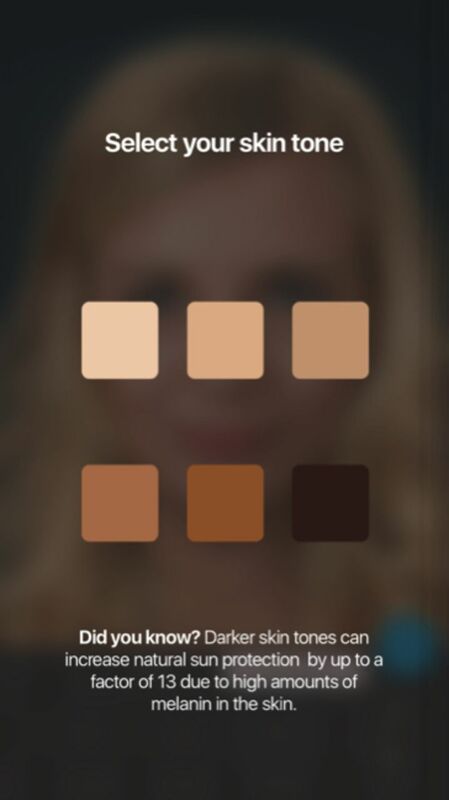 Start screen of the app prompts the user to pick his skin type. Maximum effect view: 25 years of UV damage due to weekly tanning. To produce realistic effects (figure 6) and to show the user realistic ORs for the options they choose in the app for the three most strongly associated skin pathologies, an extensive review of the current literature on UV-induced skin damage61 62 was conducted for each specific skin type. As no trials with 25 years of follow-up were available, we had to extrapolate the current evidence on UV-induced skin damage for the specific skin types. The evidence consists of more than 50 publications to create realistic effects from a clinician’s standpoint (which may differ from what the average person perceives as realistic). Explanatory graphic of the effects within the app. We recently implemented this app in two German secondary schools via a method called mirroring. We ‘mirrored’ the students’ altered three-dimensional (3D) selfies on mobile phones or tablets via a projector in front of their entire grade. Using an anonymous questionnaire, we then measured sociodemographic data as well as risk factors for melanoma and the perceptions of the intervention on a 5-point Likert scale among 205 students of both sexes aged 13–19 years (median 15 years). The Sunface trial is designed as a randomised controlled superiority trial with two parallel groups. Our primary end point is the difference between the two groups in daily sunscreen use (past 30 days) from baseline to 6-month follow-up (figure 7). The planned study period is February 2018 to November 2018. The study groups will consist of randomised classes receiving the intervention and control classes within the same schools (no intervention). Randomisation is externally and centrally performed at the school level with a 1:1 allocation (control to intervention) via computer.12 A total of at least 60 secondary school classes in Itauna, Brazil will participate in the teacher-supervised baseline survey in February 2018, which is conducted by trained data collectors. One week after the baseline survey, the intervention classes receive a 45 min app-based intervention conducted by local medical student volunteers. Follow-up surveys will be conducted at 3 and 6 months postintervention (figure 7). The school-based intervention under evaluation consists of a 45 min educational module in the classroom setting using a photoageing app. The intervention is presented by two medical students per classroom to approximately 21 students at a time. The goal is to initiate and guide the student evaluation process of skin cancer prevention with age-appropriate information that helps the students reframe positive opinions and views regarding sun protection habits in a gain-framed and interactive manner. To integrate app-based photoageing interventions into a school-based setting, we previously developed and tested the mirroring approach in a pilot study.52 Mirroring means that the students’ altered 3D selfies on smartphones or tablets are ‘mirrored’ via a projector in front of the entire class. The mirroring approach is implemented by medical student volunteers from the University of Itauna, who receive standardised training in advance. To ensure the participation of all students within a certain class and to avoid contamination within schools, we will implement the mirroring intervention via 10 Samsung Galaxy Tablets that are already set up and brought to the schools by the volunteers. In the first 10 min phase, the displayed face of one student volunteer is used to show the app’s altered features in the three categories to the peer group, providing an incentive for the rest of the class to test the app. Students can interact with their own animated face via touch (see online multimedia supplementary appendix 1). In front of their peers, they will be able to display their image as a non-sun protection user/sun protection user/weekly tanning bed user at 5, 10, 15, 20 and 25 years in the future (see figures 1 and 2). Multiple device displays can be projected simultaneously, which are used to consolidate the altered measures with graphics (eg, to explain wrinkle formation). We implement mirroring with Galaxy Tab A (Samsung) via Apple’s proprietary AirPlay interface using the Android app ‘Mirroring360’ (Splashtop). In the second 15 min phase, students are encouraged to try the app on one of the tablet computers. The number of provided tablet computers was calculated so that the phase would take up to 12 min at the most after factoring in a usage time of approximately 4 min per student. By this calculation, 25 min of the mirroring intervention and 10 provided tablets were sufficient to have every student within a class of 40 pupils successfully photoaged at least once. In the last 5 min, the perception of the intervention by the students is measured directly after the intervention in an anonymous survey on a 5-point Likert scale via four items: (1) ‘The animation of my 3D selfie motivates me to use daily sunscreen’, (2) ‘I learned new benefits of sun protection’, (3) ‘The intervention motivates me to check my skin with the ABCDE rule in the next 6 months’ and (4) ‘The intervention was fun’. Students from Itauna in Southeast Brazil attending grades 6 to 12 in all types of regular secondary school are eligible. All classes will be included in the final intention-to-treat analysis. However, app use will be assessed in both groups at 6-month follow-up to assess contamination of control classes and will be the basis for a secondary (sensitivity) analysis with the methods described in the Analysis section of this protocol. The schools are recruited via email, telephone and personal appointment (in most cases with the principal). Reasons for non-participation are not recorded. Data are collected via a paper–pencil questionnaire. In addition to sociodemographic data (age, gender and school type), the questionnaire captures the Fitzpatrick skin type, the ancestry of the school students65 and the frequency of sunscreen use in the past 30 days as well as other sun protection behaviours. These items are based on the Sun Exposure and Protection Index questionnaire66 and were either used in their original form or adapted to the specific circumstances of the present study. No Portuguese equivalents of the instruments were available; thus, we used the conceptual method for translation described by the WHO/UNESCAP (United Nations Economic and Social Commission for Asia) Project on Health and Disability Statistics.67 Newly translated and/or modified items were extensively pretested and subjected to statistical analyses (internal consistency/Cronbach’s α and exploratory and confirmatory factor analyses, which represented the basis for item selection). In accordance with the guidelines for good epidemiological practice, classes within schools are externally and centrally randomly assigned to the control or intervention group via block randomisation in a 1:1 ratio (control to intervention) via computer by a statistician at the University of Duisburg-Essen, Germany. Stratification will be performed by grade. The primary end point is the difference in the 30-day prevalence of daily sunscreen use between both groups at 6-month follow-up. Secondary end points include the difference in daily sunscreen use at 3-month follow-up, if a self-skin examination in accordance with the ABCDE rule59 was performed within the 6-month follow-up and the number of tanning sessions in the past 30 days. For all end points, the number needed to treat will also be calculated. A daily sunscreen user is defined as a pupil who claims to have used sunscreen daily or almost daily in the 30 days preceding the survey. We calculated sample sizes of 630 in the intervention group and 630 in the control group, which were obtained by sampling 30 classes with 21 students each in the intervention group and 30 classes with 21 students each in the control group to achieve 80% power to detect a prevalence difference between the groups of 5%. The daily sunscreen prevalence was assumed to be 6% under the null hypothesis and 11% under the alternative hypothesis based on a small pilot survey with 150 students in Itauna. The test statistic used is the two-sided score test (Farrington & Manning). The significance level of the test is 0.05. Normal class size in Brazil is 35 pupils; a lost to follow-up effect of 40% was taken into account. Data entry will be supported by the current software version of Formic Fusion by Xerox AG (Kloten, Switzerland) and the recommended scanners. To examine baseline differences in pupils’ characteristics in our experimental design, we will use χ2 tests for categorical variables and t-tests for continuous variables. To test for between-group differences in baseline and follow-up daily sunscreen use in the past 30 days, we will use a cluster-adjusted Mantel-Haenszel χ2 test69 with a significance level of 5% (two-sided). For the main analysis, hierarchical linear models (HLMs) will be applied. HLM can handle the nested structure of the data and will be used to test for between-group differences in within-group changes in sun protection behaviour over time. HLM will also be used to investigate the influence of further covariates (such as gender, European ancestry and skin type) and time-dependent behaviour in secondary analyses. Statistical analyses will be performed using SPSS Statistics V.24. 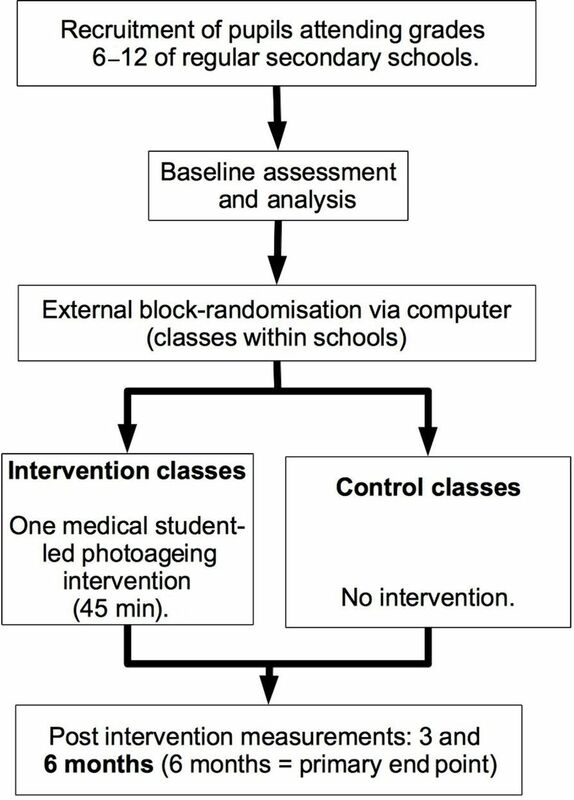 This is the first cluster-randomised school-based trial on photoageing skin cancer prevention and the first trial on medical student-delivered school-based skin cancer prevention worldwide. While classic health educational school-based approaches in skin cancer prevention were evaluated as inferior to appearance-based approaches,19 there is a global lack of novel, innovative strategies that harness current technology while taking widely accepted theories for behavioural change into account.64 Although multiple studies have shown that skin cancer risk is predominantly associated with sun exposure early in life, there is often a lack of awareness in risk groups. Because this study is conducted only in Brazil, the results may not be generalizable to other cultural or national settings. However, the theoretical basis for this intervention (the TPB) has been proven to apply to most cultural contexts around the globe.64 As this trial enrols approximately 10 different public schools, it should be representative for most school types. We must choose classes and not schools as a cluster due to sample size limitations; thus, cluster effects cannot be entirely excluded. However, multiple steps are taken to limit contamination between the control and intervention classes (ie, the name of the app is not mentioned to the pupils by the trained medical students and the teachers of the control classes are strictly prohibited to talk about the intervention with their students). Cluster effects are also monitored in the end line questionnaire and provide a basis for a sensitivity analysis. In summary, we evaluate the long-term effects on behaviour of a novel method that integrates photoageing in a school-based skin cancer prevention programme in a population with a high risk for developing skin cancer. The programme affects the students’ peer group and also considers predictors for tanning. Participation is voluntary and oral consent is sufficient. The ethics committee of the University of Itauna waived the necessity for informed written consent. All participant information will be stored in locked file cabinets in areas with limited access. The participants’ study information will not be released outside the study without the written permission of the participant. Results will be disseminated at conferences, in peer-reviewed journals and on our websites. The authors thank all participating schools, students, volunteering medical students and teachers who helped to organise the classroom visits in the city of Itauna.
. Sunscreen use in the prevention of Melanoma: common sense rules. Virginia, USA: American Society of Clinical Oncology, 2016.
. [Sunburn in young people: population-based study in Southern Brazil]. Rev Saude Publica 2008;42:26–33.
. Cutaneous melanoma: a 30-year-long epidemiological study conducted in a city in southern Brazil, from 1980-2009. An Bras Dermatol 2011;86:932–41.
. A skin cancer prevention photoaging intervention for secondary schools in Brazil delivered by medical students: observational study. JMIR Mhealth Uhealth 2018.
. The theory of planned behavior. In: Lange PAM , Kruglanski AW , Higgins ET , eds. Handbook of theories of social psychology. Vol. 1. London, UK: Sage, 2012: pp. 438–59.
. Translation & linguistic evaluation protocol & supporting material. Geneva, Switzerland: WHO/UNESCAP Project on Health and Disability Statistics, 2003. Contributors TJB initiated the study, invented, designed and organised the intervention, wrote the manuscript, drafted the design of the study and will perform the statistical analyses. BB-S participated in the conception of the study. MVH, MCK, YN, MG, FB and DS contributed to the design of the study and data analyses and proof-read the manuscript. BB-S and OCL contributed to the design and logistics of the study, assisted with the translation of classroom materials and reviewed the final version of the manuscript. BLF, OMdF, HAL and ACCO will conduct data entry and coordinate/conduct the intervention in Brazil. They also supported the translation of the classroom materials and proof-read the manuscript. All authors declare responsibility for the data and findings presented and have full access to the final trial dataset. Funding The tablets are funded by the Young Research Award Research Grant from La Fondation La Roche Posay awarded to TJB for his research on the Sunface app. The University of Itauna will contribute by providing logistic support for the project and copies of all questionnaires. Disclaimer La Fondation La Roche Posay (LA FONDATION LA ROCHE-POSAY, Att : Cécile Voletm 62 quai Charles Pasqua, 92300 LEVALLOIS PERRET, France) and the University of Itauna Funding Board had no role in the design and conduction of this study or in the preparation, review or approval of this manuscript. Ethics approval Ethics approval was obtained from the ethics committee of the University of Itauna.